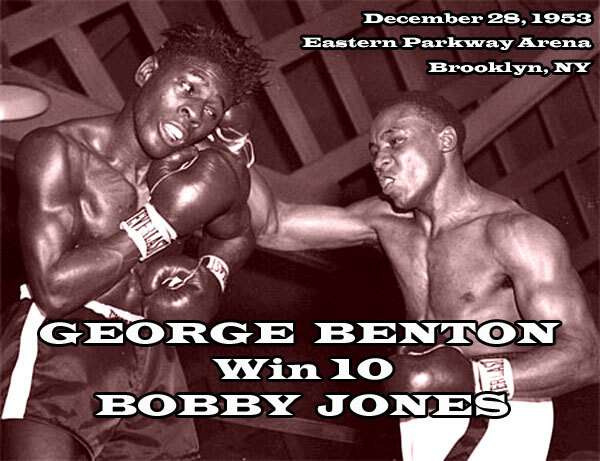 George Benton closed out his fifth year as a pro with a decision win over Bobby Jones on this day in 1953. Benton, a 4-1 favorite, took his 25-2 record into Brooklyn's Eastern Parkway Arena against a very seasoned foe. Expectations were that the rising pro would easily handle Jones, the old pro with a 33-19-8 record. But as was the case many times in Benton's career, things didn't turn out to be as easy as predicted. Jones jumped out to take an early lead in the 10 rounder. Benton fought back well and in the end, came away with the win. But the decision was split and was considered a close call. It was George's 26th win but he still had another 15 years of fighting before him. His career was an excellent one, but it was filled with frustration. The long-time top contender fought numerous fellow contenders, but was never given an opportunity to fight for a world title.